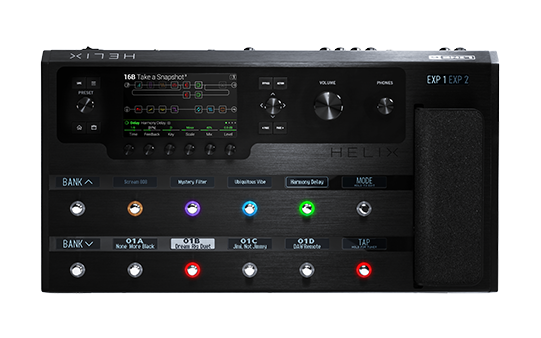 Helix® Floor and Helix Rack are the flagship guitar processors of the Helix family, offering incredible power, flexibility, and control. 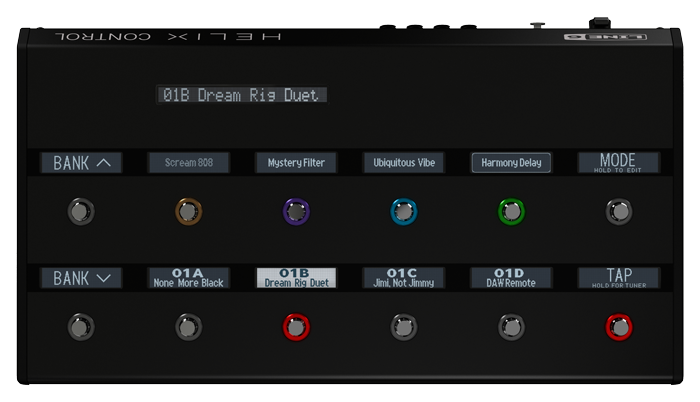 HX Modeling uses dual-DSP processing to deliver the nuanced character that exists in the original classics, giving you natural bloom, compression, modulation, and honk on some models, as well as intense gain and breakup in others. Not only do HX Models sound and feel real, Helix Floor and Helix Rack processors are comprehensive master controllers for your guitar system, with extensive I/O that provides unprecedented flexibility for studio and stage. Touch-sensitive footswitches, customizable scribble strips, and a large color LCD make the user experience faster and more efficient. Just in case you ever stop playing guitar for more than a few hours. Connect Helix to a grounded AC power outlet. Helix also functions as a high quality, multi-in/out, 24-bit/96kHz audio interface for Mac® and Windows® computers, with DI, Re-amping and MIDI functionality built right in. Helix can also record to an Apple iPad (with optional Apple Camera Connection Kit). Two additional expression pedals can be connected to Helix and assigned to adjust a wide variety of parameters. Connect to your traditional guitar amp to switch its channels or turn its reverb on and off. 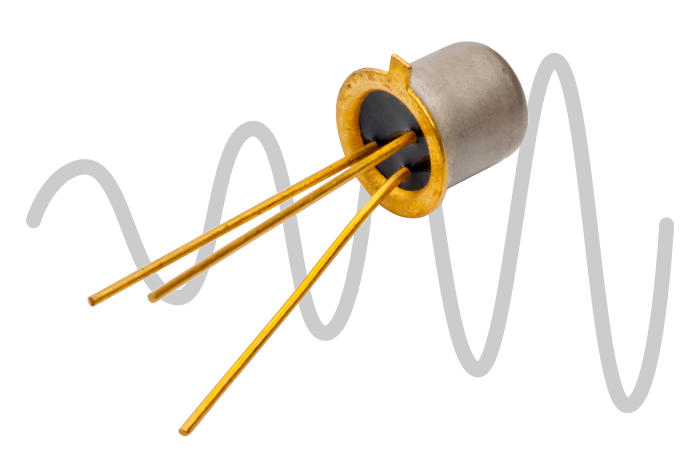 Use a TRS cable for dual operation (1=tip, 2=ring). Connect to the expression pedal input on stompboxes or CV (Control Voltage) input on vintage pedals or synths. Connect your primary guitar or bass guitar here. 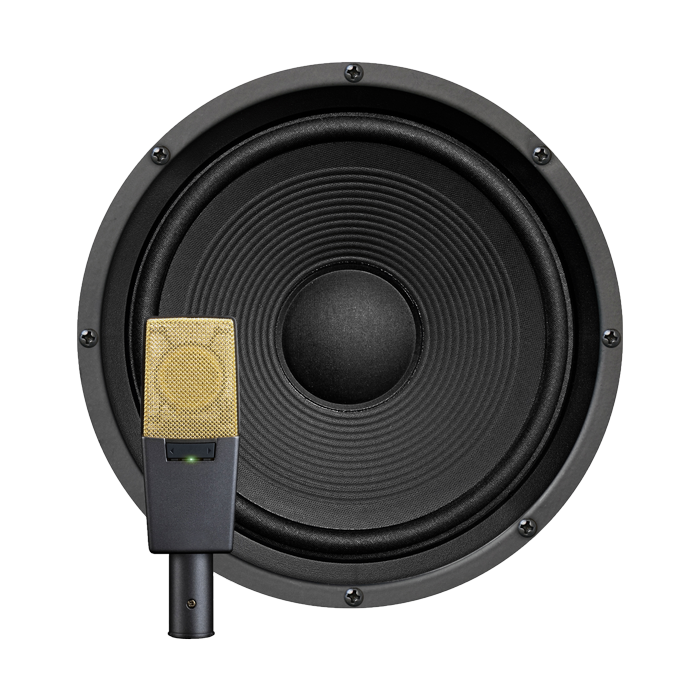 This jack provides 123dB of dynamic range, a digitally-controlled impedance circuit, and switchable pad. Connect a secondary, active-pickup equipped guitar or bass here. Plug your microphone in here for processing your vocals or recording to your computer via USB. This XLR jack provides 48V phantom power for studio condenser mics and a variable low cut filter. These 1/4” ins and outs can be used as FX loops for inserting external stompboxes into your tone or as additional inputs and outputs for connecting keyboards, drum machines, mixers, and other gear. 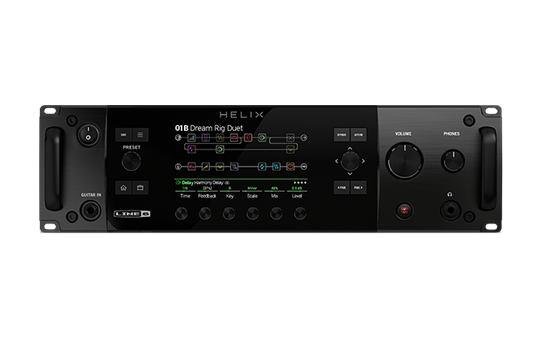 Helix can process multiple instruments simultaneously, in stereo, with discrete inputs and outputs. If you are experiencing hums and buzzes, press this button in to eliminate ground loops between your equipment. Use balanced XLR cables to connect to your studio gear or the house mixer, PA or FRFR speaker(s) when playing live. When using a mono playback system, connect only the LEFT/MONO XLR jack. Use unbalanced 1/4" TS cables to connect to your guitar amp, FRFR speaker(s), studio monitors, or other playback system. When using a single amp or speaker, connect only the LEFT/MONO 1/4” jack. Connect stereo headphones here; turn the top panel PHONES knob to adjust volume. 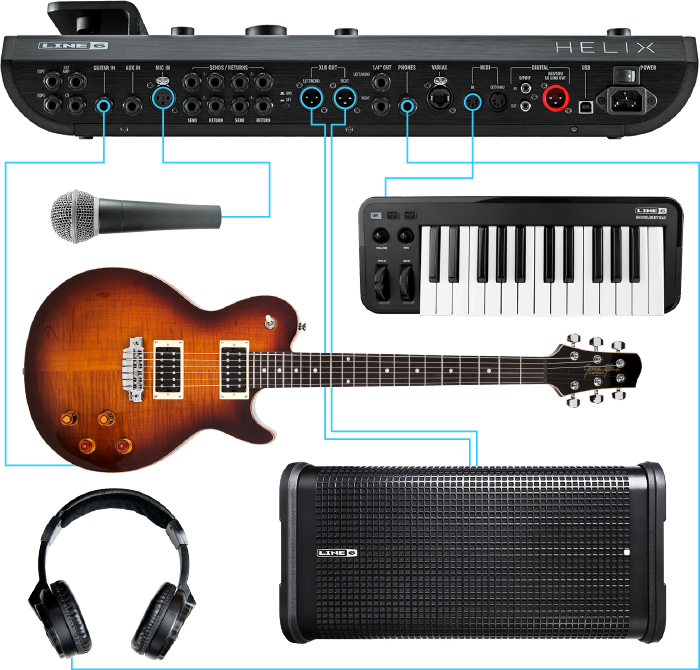 This input provides power, digital audio, effects control, and instant recall between Helix and a Line 6 Variax guitar. 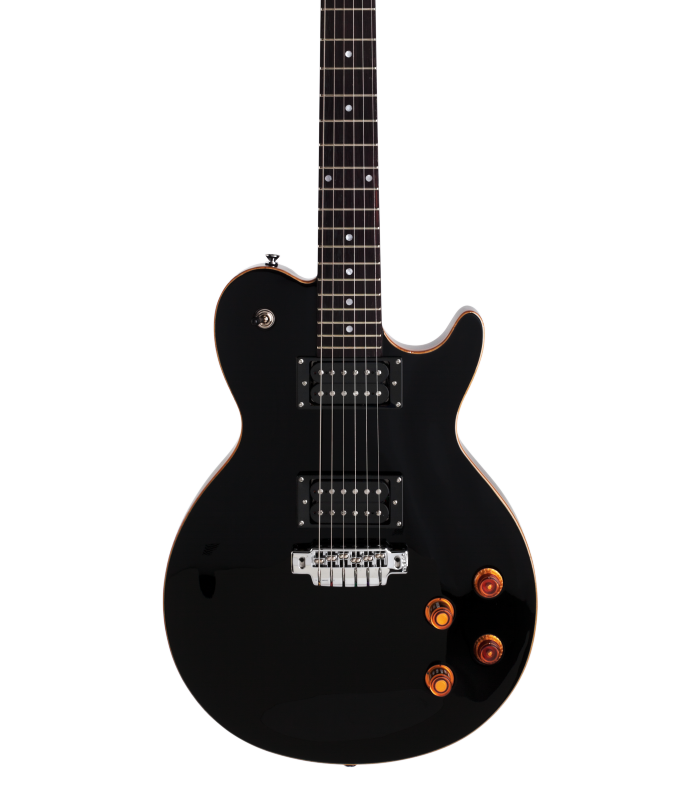 Imagine pressing a single switch to jump between a hollow body guitar set to DADGAD and a solid body guitar (or banjo!) set to drop C#. Now imagine turning your guitar’s tone knob to control multiple amp and effects parameters. The integration between Variax and Helix is unprecedented. Connect Helix to your MIDI gear for sending and receiving program changes, continuous controllers, and other MIDI messages. Digitally connect Helix to your studio equipment via S/PDIF (75-ohm RCA) cables. 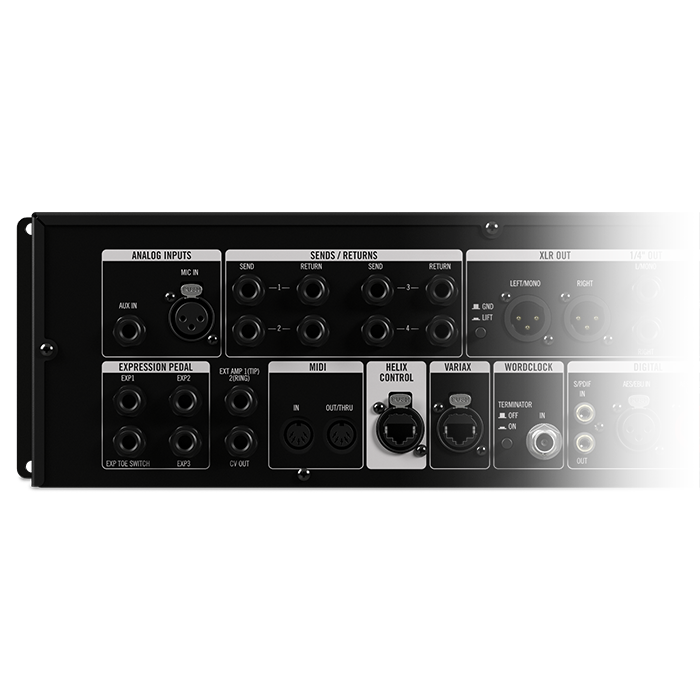 L6 LINK provides easy digital audio connectivity between Helix and Line 6 StageSource monitors and/or DT-Series amplifiers. Alternatively, digitally connect Helix to your studio equipment via an AES/EBU (110-ohm XLR) cable. Press this button to rename or save changes made to the preset. Press twice to quick save. Press this button to dive a bit deeper into Helix, and you'll find Command Center, Global EQ, Global Settings, and other menus. Turn to select presets. Press to open the Setlist view, where you can access up to 1,024 preset locations. If you ever get lost, press this button to return to the main Home screen. Press this button to quickly jump to the tonestack parameters (Gain, Bass, Mid, Treble, etc.) 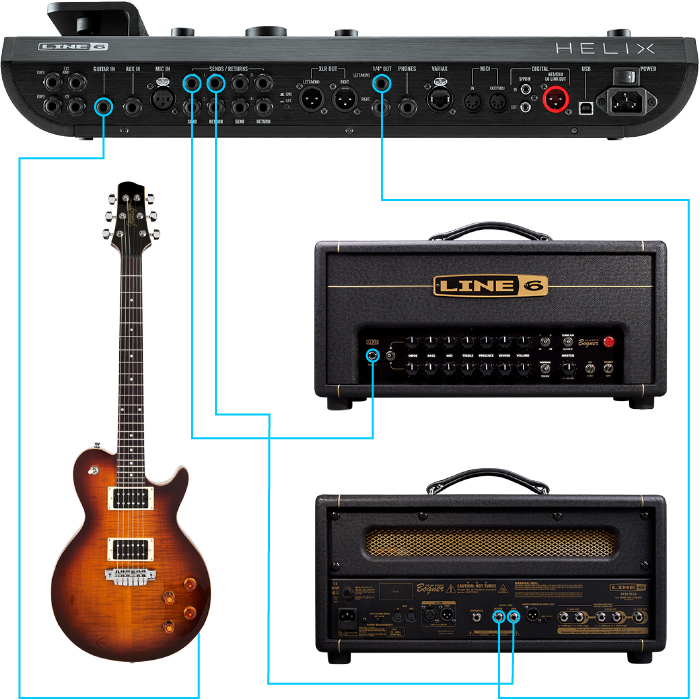 of any Amp+Cab, Amp, and Preamp models in the current preset. If your preset has more than one of these types of block, press multiple times to cycle through all tonestacks. This large color LCD is your window into the power of Helix. Most functions can be accomplished without any menu diving. Press this button to turn the selected block on and off. Press this button to open the action panel for the selected block or screen. From the Home screen, the action panel lets you move, copy, paste, and clear blocks. Other screens may have unique action panels; for example, the Global Settings action panel lets you reset all global settings at once. If the selected block or item has more than one page of parameters, dots appear to the right of the item’s name. Press < PAGE or PAGE > to view more parameters. Turn this knob to control the main output volume. Turn this knob to control volume from the PHONES output. Turn one of the six knobs below the main display to adjust the parameter's value above; press the knob to reset the parameter's value. If a rectangular button appears above a knob, press the knob to engage its function. Press and hold a parameter’s knob to quickly jump to the Controller Assign page for that parameter. The thirteen Helix LCD scribble strips tell each footswitch's current assignment, so there are never any surprises during a show. If a particular footswitch has more than one block or item assigned, the scribble strip may read “MULTIPLE (X)," where X is the number of assignments. You can even customize the scribble strip’s label and footswitch LED color. Step on FS1/FS7 to select the next/previous bank of presets. Press both FS1 and FS7 to enter Snapshot footswitch mode. 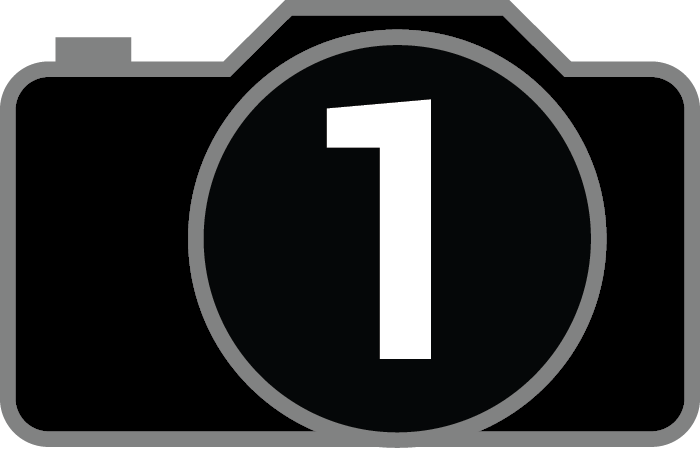 Hold both FS1 and FS7 to cycle through Bank, Preset, and Snapshot Up and Down. While in Preset footswitch mode, step on a footswitch to select a preset. While in Stomp footswitch mode, step on a footswitch to toggle its block(s) on and off. Touch a footswitch to select its assigned block or item. Touch repeatedly to cycle through multiple assigned items. Touch and hold to assign that footswitch to the selected block. Touch and hold two switches to swap all assignments. Footswitches do a lot too. Step on FS6 to toggle between Preset and Stomp footswitch modes. Hold for Pedal Edit mode (edit blocks with your feet, even while playing!). Repeatedly step on FS12 to set tempo. Hold to open the Tuner. Touch briefly to open the tempo panel. Feels and sounds like analog gear. When it comes to authentic sound and feel, Helix Floor and Helix Rack guitar processors represent a giant leap forward in modeling technology. Dual-DSPs provide massive power to accurately recreate the sonic characteristics and full dynamic response of classic and modern amplifiers and effects. A new approach to speaker cabinet modeling. Helix HX Hybrid cabs represent a new approach to the speaker cabinet capture process. They provide the same resolution and low-end accuracy as a 2048-point or higher Impulse Response, while only using roughly the same amount of DSP power as a 1024-point IR. A choice of 16 different microphones and 23 recording distances provides additional sonic flexibility and real-time dynamic control. Helix Floor and Helix Rack processors also let you load custom impulse responses, allowing you to personalize your rig even further. Models that respond like the real thing. 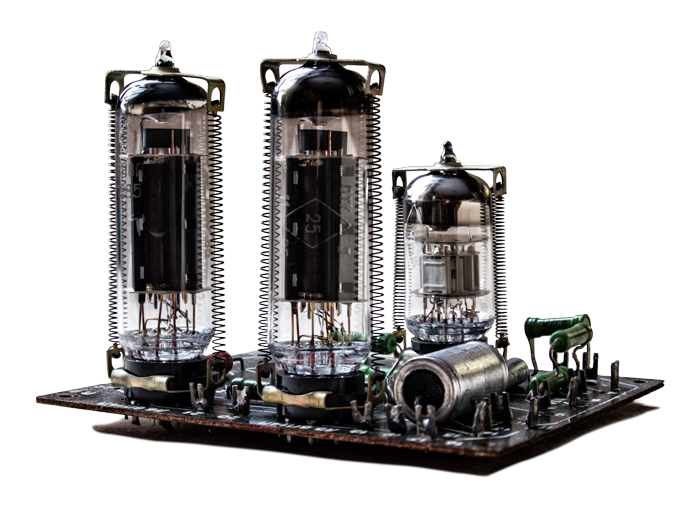 With Helix processors, each stage of an amp’s circuitry has been measured and matched back to the original, so that each model reacts and interacts with the player as expected. This level of dynamic circuit detail extends into areas such as power supply ripple, individual tube sag, and control over B+ voltages. Effects models with unprecedented authenticity. HX Modeling accurately recreates the behavior of even the most idiosyncratic vintage effects by modeling their individual components. The Transtronic process emulates the behavior of virtually any germanium or silicon transistor diode, making it possible to authentically recreate fuzz, distortion, and other pedals once considered too persnickety to convincingly model. The Throbber is a "virtual lightbulb" that mimics the decidedly nonlinear behavior of the small incandescent bulb and four photocells inside the original 1960's Uni-Vibe pedals that are essential to their unique sound and vibe. And the Bucketier chip and Panda circuit are virtual recreations of the Bucket Brigade (BBD) chips and compander (compression/expansion) circuitry found in many old-school analog delay pedals. Accurately modeling the inherent quirkiness of vintage analog delay pedals at the component level endows HX analog delay effects with all of their lo-fi majesty. So intuitive you already know how to use it. Massive power traditionally comes with a steep learning curve, but Helix processors are remarkably easy to use. Touch-sensitive footswitches allow you to select an effect block or other item for editing simply by tapping it with your finger. A large 6.2-inch, 800x480-pixel LCD eliminates complex menu-diving and provides the same level of control you might expect from an external editor. Colored LED rings and customizable scribble strips complete the user interface, letting you know what each footswitch is doing at a glance. Simply touch a footswitch to instantly jump to any block and quickly adjust a parameter or assign controllers. So fast, you can comfortably assign any item to a switch in three seconds. Footswitch status at a glance. Color-coded LED rings and customizable scribble strips convey footswitch assignments and status at a single glance. The Snapshots feature enables you to create up to eight variations within a single preset and seamlessly transition between them without experiencing the audio dropouts and disruption of delay and reverb trails that normally occur when switching between DSP-intensive presets. Enable and bypass effects blocks, change amp and effects settings, and much more—all within the same preset. 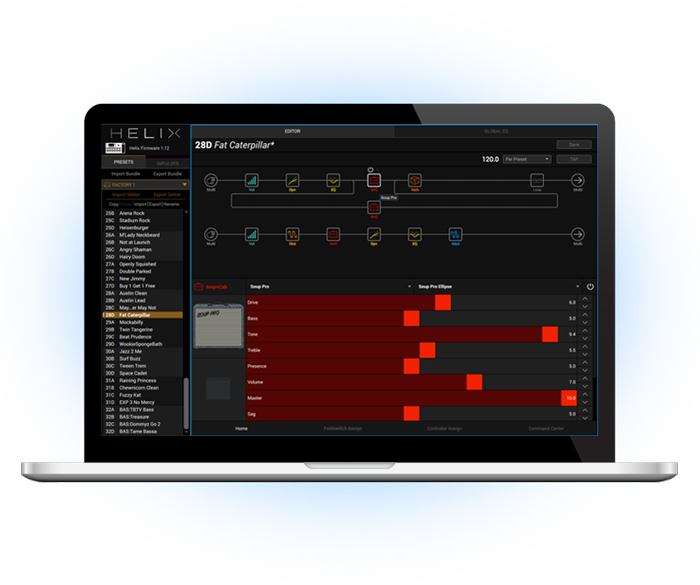 With four stereo signal paths per preset, the Helix Floor and Helix Rack processors allow you to create complex routing scenarios involving numerous effects and other blocks, connected in countless ways. Routing schemes such as wet/dry/wet and 4-Cable Method are also easily configured. Continue playing while you edit. Helix processors were designed to make interacting with technology more intuitive. Pedal Edit mode, for example, allows you to edit any amp or effect parameter with your foot, so you don’t have to stop playing while making changes on the fly. Simply select the block you want to edit and its parameters spill across the footswitches. Then select a parameter and adjust its value using the expression pedal. As easy to use as Helix. Helix Edit software features the same intuitive user interface found on the Helix Floor and Helix Rack processors, so there’s no learning curve. Drag and drop amps, cabs, and effects to build complex signal chains with ease; adjust settings and parameters using dedicated sliders and knobs; customize footswitch labels quickly and efficiently, and much more—all on your computer’s large screen. Integrate and control external hardware. Helix Floor and Helix Rack processors can serve as the nerve center for your entire studio or live rig by enabling you to easily integrate effects pedals and other hardware into a hybrid setup. Four effects loops provide limitless flexibility. Connect individual pedals or pedal chains to the four mono or two stereo effects sends and receives to create switchable loops, or assign the effects loops to discrete signal paths to process multiple instruments simultaneously, or split the sends and receives up and use them as freely-assignable inputs and outputs. 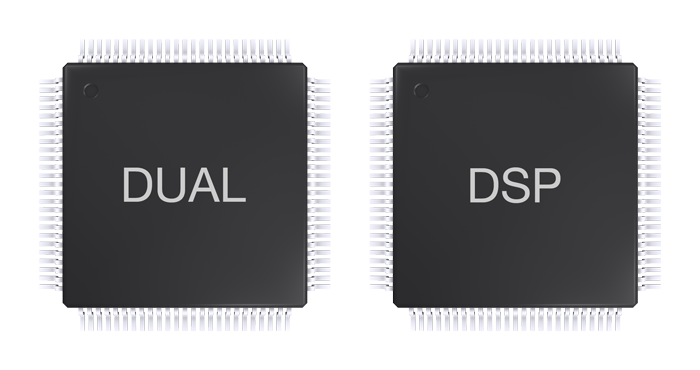 This unparalleled flexibility allows you to create large integrated systems incorporating both digital and analog I/O. When you need to incorporate external devices via MIDI, Helix Floor and Helix Rack processors offer maximum flexibility. In addition to powerful real time MIDI control, they can send up to six separate commands at preset recall, enabling you to, for example, change a preset on a synth, start a sequencer, and turn up a fader on an external digital mixer with a single press of a footswitch. And with their two expression pedal inputs, CV/Expression out, and external amp switching, Helix Floor and Helix Rack processors can serve as the command center for any size rig. Access the full power of Helix Rack. Adding the Helix Control pedal to the Helix Rack processor accesses its full functionality. Features include twelve capacitive-touch footswitches with colored LED Rings and customizable scribble strips, three expression pedal inputs, and hands-free editing when in Pedal Edit mode. No other foot controller offers these features or merges so effectively with the Helix Rack processor. Open up new performance possibilities. Helix Floor and Helix Rack processors feature Variax® guitar control enhancements that enable you to toggle between two guitar models with a footswitch, control Helix amp and effects parameters from the volume and tone knobs on your Variax guitar, set each string’s tuning per preset or snapshot, and much more.